‘I have a fetishistic relationship with paper and dust’, admits Reece Jones and anyone familiar with the work he has produced over the past ten years will have no problem believing this. The young artist from London, up until now, has shown works produced solely with charcoal but don’t be fooled into thinking this in anyway makes his work repetitive. Jones has created an interesting process in which he builds his drawings through repeated layering of charcoal and its erasure with sandpaper. The finished effect is a series of dark, surreal images, often landscapes, whose inexplicit narratives are fully open to viewer interpretation and change with every fresh viewing. His new exhibition, ‘Control Test’ opened at the Triumph Gallery in Moscow yesterday. 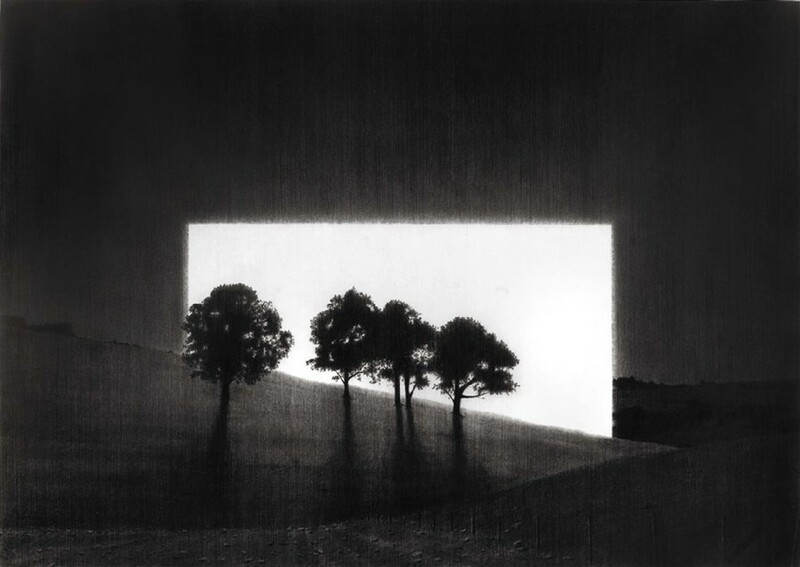 His first solo exhibition outside London also sees another first for this artist; alongside his signature large scale charcoal landscapes he will also be displaying some small watercolours, the title of this series from which the exhibition takes its name. These watercolours maintain the monochrome palette and mysterious, surreal feel of the charcoal images but are an interesting stylistic progression for this talented young artist. Dazed Digital: What motivates and drives you as an artist? Reece Jones: I actually don’t know. To be honest I think it would be easier to list the factors which could potentially be de-motivational. I think that making the space to make and look at art is quite tough at times. It’s not a matter of justifying it (I am absolutely certain about why art is important to me), but it’s a question of specific pieces legitimacy or relevance - in the grand scheme of things. That can keep me awake at night! DD: How did this project begin and what are you trying to convey with it? Reece Jones: It began while watching Richard Dreyfuss build the mountain in Close Encounters over and over again out of mashed potatoes when I was a kid. Or maybe it began while being properly bamboozled by Fred Sandback’s yarn install at The DIA Centre, Beacon New York. It’s sheer perfection, that notion that something so simple can be so unnerving and beautiful. Or perhaps it was seeing pictures of Michael Heizer’s City Complex. It’s an evolution of ideas from previous works and a chance to tap in to some notional or thematic reservoirs I’ve been storing up for a while. DD: This is your first solo show outside the UK. When you started the work were you aware that you were going to be showing it in Moscow and if so do you think this has impacted in any way upon the finished result? Reece Jones: Yes this body of work was made with the Moscow show in mind. But I don’t think it’s ‘Russian’ either in concept or in theme. I even made a drawing called 'This Is England', it’s a pastoral scene I guess. I would have found it strange as a foreigner trying to tap conceptually or culturally into Russia directly. It would have felt rude or presumptuous somehow. I wanted to take what I do and what defines my personal interests to a new audience and let the work be interpreted there. I’m at the gallery now and the installation is happening around me... The feedback I get while I’m over here will be really interesting. I can’t wait to see the response. DD: This body of work sees the thematic use of a 'blank' rectangle which acts almost as a light source amongst the dark landscapes. Where did the inspiration for this come from and what is the idea behind it? Reece Jones: One of the things I’ve been really interested in over the last few years has been light balance and the potential of a pictures light sources being ‘illogical’ or surreal. Ultimately I get to play formal, compositional games with tonal areas and surface, but I can also encourage a range of thematic readings with these elements too. Sometimes they seem extra terrestrial or other worldly, sometimes filmic or atmospheric, sometimes menacing or parasitical. In this series I suppose I’ve acknowledged the potential of the ‘light source’ to be a pictoral device or to hint at an art which is purist in terms of the abstract placement of ‘things’. I’m being greedy of course, because the work is undeniably figurative and suggests various narratives as well. DD: There is a clear difference between the 'Control Test' series and the others in the exhibition, such as, the Windbreak pictures. How did this difference come about and what effect do you think it has on the work? Reece Jones: The Control Test Series are paintings. They’re little watercolours. The rest of the works are large process based drawings in charcoal. I’ve always made little paintings in the studio, but this is the first time I’ve actually included them in a show. They are made with one continuous brush stroke from top to bottom with some simple elements masked out. This process is then slightly altered and repeated time and again, which references the process of making the drawings (layers of applied and removed visual information, suspended layers of dust laying on top of and affecting one another). I’m showing them because I really think they worked. I find them quite beautiful and they also help to explore the notion that there is a shifting irregular topography within this series, which is challenged and controlled by these more minimal, non-organic moments. DD: The process you have devised with charcoal and sandpaper features heavily in all your work. Whilst this gives you a very strong and unique style do you ever feel temptation to explore other mediums? Reece Jones: Yep. I haven’t always made drawings in this way and there are constantly other things going on in the studio like watercolours, photography and a bit of film. I think that these elements will inevitably creep into my exhibitions. I have to admit I do have a fetishistic relationship with paper and dust though. It’s a bizarre, counter intuitive methodology I’ve built for myself but I certainly don’t feel that I’ve exhausted it. It evolves all the time. DD: It often seems that we are in an age where the most talked about art are attention grabbing installations and performances, what are your views on this and where do you think your pictures fit into this landscape of modern art? Reece Jones: I’m primarily a viewer of art. I look at and talk about a lot more than I can personally make. I definitely don’t have dogmatic principles when it comes to ‘types’ of art. Of course motivation is important (why might someone have been compelled to make something?) but taking everything at face value and approaching with an open mind I can be turned on by pretty much anything.... if it’s good! Impact is nothing new as a tool for art presentation. Impact can be good. Used clumsily or in a needy way I find it short sighted and nihilistic but all art is capable of that. I try not to think too long and hard about where I ‘fit in’ to the landscape. I think that’s a dangerous thing to do. Art is a big word... It’s a big complicated word. DD: Your first overseas solo show must feel like a big rite of passage for you as an artist, what do you think are the most important things you have learnt since you began showing professionally? Reece Jones: That no amount of insistence or cross-referencing can prevent the viewer from bringing their own deeply complex interpretative mechanisms to bear on you. I am increasingly into the notion that I would always prefer to ask more questions in the work than I could answer. DD: What comes next for you? Reece Jones: I’m already working on a new series for a solo show in London at All Visual Arts’ new space this coming winter.